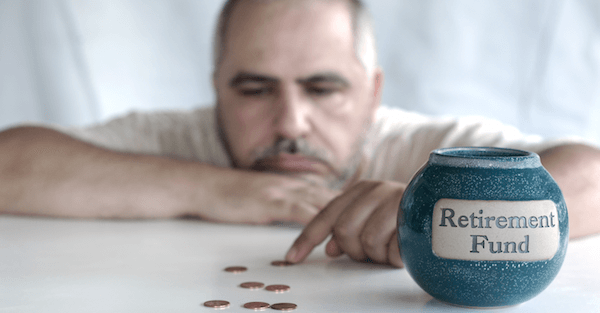 Last week, the financial services giant Northwestern Mutual released new data showing that 1 in 3 Americans has less than $5,000 in retirement savings. It’s an unfortunately familiar story. And Northwestern Mutual’s data is entirely aligned with other research we’ve seen in the past, including our own. The Federal Reserve’s most recent Survey of Consumer Finances, for example, shows that the median bank balance among US consumers is just $2,900. And Bank of America’s annual report from last year showed that the average balance per HOUSEHOLD (i.e. -not- per person) was $12,870… which was actually LESS than the average account balance that Bank of America reported in 1997! On average, the typical US household has less savings today than they did 20 years ago… and almost nothing put away for retirement. In fact 21% of Americans (based on Northwestern Mutual’s data) have absolutely nothing saved for retirement. And 33% of Baby Boomers, the generation closest to retirement, have between $0 and $25,000 saved for retirement. That’s hardly enough savings to last more than a few years… and a major reason why most retirees currently rely on Social Security to meet their monthly living expenses. According to a Gallup poll from last May, 58% of US retirees said that they rely on Social Security as their major source of income. They simply don’t have enough of their own personal savings stashed away. But as we’ve discussed many times before, Social Security is rapidly running out of money. The most recent report from Social Security’s Board of Trustees (which includes the US Secretaries of the Treasury, Labor, and Health & Human Services) tells us that the program’s cost has exceeded its tax revenue since 2010. Last year this shortfall was $59 billion, 11% worse than in 2016. And in order to make up the difference and cover this deficit, Social Security has to dip into its trust fund, effectively burning through the program’s savings. The problem with this approach is that, eventually, these annual deficits will burn through ALL of the program’s savings. The government knows this; the Board of Trustees even state this in their annual report, projecting that the Social Security trust funds will become fully depleted in 2034. Sixteen years may seem like a long way off. But we’re talking about retirement here. You’re supposed to think long-term about retirement. And the math simply doesn’t add up. The Trustee Report states explicitly that, once the trust funds run out of cash, the program will have to, at a minimum, reduce the monthly benefit that’s paid to its recipients. So if you’re planning on being retired at any point past 2034, the government is LITERALLY TELLING YOU that they won’t be able to pay the retirement benefit that’s been promised to you. Longer term (pay attention to this if you’re under 40), the numbers get even worse. The way Social Security works is that retiree benefits are essentially paid for by people who are currently in the work force. If you have a job, a portion of your paycheck each month goes to Social Security and ends up in the pockets of people who are currently retired. In order for Social Security to function, there has to be a certain number of workers paying into the program for each retiree. Social Security tracks this worker-to-retiree ratio VERY closely. The higher the ratio, the better. In 1995, for example, there were 4.9 workers paying into the program for every retiree receiving benefits. By 2020, Social Security projects the ratio will be down to 3.7 workers per retiree. And by 2040, just 2.75. That’s simply not enough workers. Do the math– at 2.75 workers per retiree, you’d have to pay nearly 40% of your salary just in Social Security tax (i.e. NOT including Medicare, federal, or state income tax) to keep the program running. It’s also noteworthy that, just this morning, the US government released data showing that the birthrate in the United States is at a 30-year low. If you project this alarming trend forward by a few decades, you can see how the worker-to-retiree ratio could easily fall below Social Security’s already dismal forecast. It’s not just Social Security either. State and local pension funds, and even a lot of union and corporate pension funds, are also terminally insolvent. A report issued a few months ago by the American Legislative Exchange Council estimates that the total amount of unfunded liabilities for state and local government pensions now exceeds $6 TRILLION. Bottom line, Social Security is broken. State and local pensions are broken. And the federal government is far too broke to be able to bail any of them out. Even the Social Security trustees admit this– they’re practically giving us a date to circle on our calendars for when the program will run out of money. Yet a disturbing number of Americans has little to nothing set aside for retirement… and they’re expecting to be able to rely on Social Security. Something is obviously wrong with this picture, and it would be utterly ludicrous to expect this won’t have a substantial impact. — or retirees who have no savings and rely exclusively on the program to survive are going to have their benefits drastically slashed. Either way, retirement is a nuclear problem set to explode in the Land of the Free. One way or another, tens of millions of people are going to have their lives turned upside down. And it is beyond the powers of the government to do anything to stop it.